Sacramento, Calif. – Numerous motion picture appearances, countless television shows, sitcoms and standup specials, a talk show, three radio shows, and three books. Cedric ‘The Entertainer,’ Eddie Griffin, D.L. Hughley, and George Lopez have been breaking ground in the comedy business and bringing the laughs for decades. Back by popular demand! 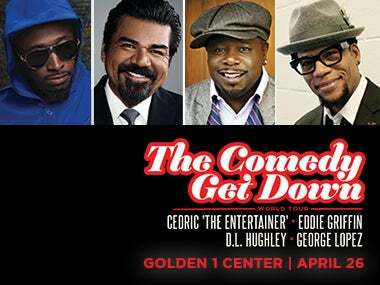 This is a once in a lifetime chance to see four members of comedy royalty come together for the comedy event of the year ‘The Comedy Get Down’ on Thursday, April 26 at Golden 1 Center. Tickets are on sale at 10 a.m., Friday, February at Ticketmaster.com. Cedric "The Entertainer" is best known for crowd-pleasing performances in hit films & television shows such as Barbershop (franchise), Be Cool, The Original Kings of Comedy, and the top-ranking Madagascar animated franchise, as well as being executive producer and star for five seasons of his own hit comedy series, “The Soul Man” on TV Land. Currently, Cedric stars (along with his fellow funnymen George Lopez, D.L. Hughley, Eddie Griffin, & the late Charlie Murphy) in the clever mockumentary TV series, "The Comedy Get Down" (based on the current national tour of the same name) which cleverly exaggerates the many funny things that happen to the comics while on their real-life tour. Additionally, Cedric co-stars opposite Tracy Morgan and Tiffany Haddish in the much-buzzed about new TBS comedy series, "The Last OG." D.L. Hughley has created a name for himself as an accomplished stand up, actor, talk show host and author. D.L. starred in his namesake TV show that ran on ABC, “The Hughley’s,” and is also well known as one of the standout comedians on the hit comedy tour and docu-film The Original Kings of Comedy. In addition to touring on the Comedy Get Down Tour, D.L. can be heard weekday afternoons as host of the nationally syndicated radio show “The D.L. Hughley Show.” Known for being astute and politically savvy in true comedian style, Hughley is a published author; and was honored with a prestigious Peabody Award for his satirical documentary special “D.L. Hughley: The Endangered List.” His third book, How Not to Get Shot, is scheduled for release this June 2018. George Lopez is a multi-talented entertainer whose career encompasses television, film, standup comedy and late-night television. For two seasons, Lopez hosted “Lopez Tonight”, a late-night television talk show on TBS; and television’s groundbreaking hit sitcom “George Lopez”, which ran for six seasons on ABC. Lopez has risen to become one of the premier comedic talents in the entertainment industry and has been named a Harris Poll top 10 favorite television personality. Lopez is also known for his extensive charity work with various foundations. In 2017, Lopez filmed his HBO Comedy Special, George Lopez: The Wall, Live from Washington, D.C.. Currently, he is the star in the hit TV Land comedy “Lopez”. Eddie Griffin has received worldwide recognition for acting, writing and producing numerous stand-up comedy specials, movies, television appearances, and music and comedy albums. A few notable projects from Griffin include “Def Comedy Jam,” “HBO One Night Stand,” “Malcolm & Eddie” for which he won the NAACP Image Award for Best Actor in a Comedy Series award, Undercover Brother,John Q., Jason's Lyric, My Baby's Daddy, Dysfunktional Family, Norbit, “Freedom Of Speech”, “A Fool And His Money” (stage play), “You Can Tell Em' I Said It” and, most recently, "All About The Money" (Netflix), A Star Is Born opposite Lady Gaga (2018), and his much anticipated Comedy Special "Eddie Griffin: Undeniable" airing on Showtime Networks February 9, 2018. Comedy Central also honored Eddie as one of the Top 100 Greatest Stand-Up Comedians of all time.